Crude prices are $49.12 this morning, losing 4 cents (.08%) since yesterday’s closing price of $49.16. Prices saw steep losses yesterday, shedding over a dollar and falling back below $50/bbl less than 24 hours after reaching that level. Refined products have seen more strength, with diesel prices gaining .42 cents (.26%) this morning to reach $1.6455, while gasoline lost .69 cents to land at $1.6544. Gasoline and diesel prices are now within a penny of each other, which is the closest they’ve been in recent months. Both diesel and gasoline have been performing more strongly than crude prices, likely driven by high demand for both and mostly consistent stock draws. Refined products have also been supported by an outage at the Pernis refinery in Europe, the largest refinery on the continent. Yesterday, Pernis announced their operations would not be brought online before the middle of August, putting more pressure on U.S. refineries to meet demand. Prices weakened yesterday as OPEC output in July was said to rise 210 Kbpd compared to June, which was not a surprise but also did not help keep prices high. 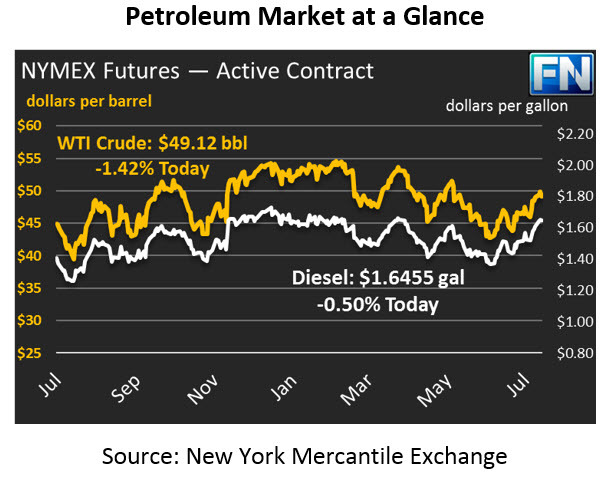 With OPEC driving much of the price increase, any news of weakness could hurt prices. Contributing to the bearishness yesterday was the API’s report of a 1.8 MMbbl build in crude prices, a surprise to a market expecting a 3 MMbbl draw. Increased imports to support refinery inputs are likely the reason for the build. Refined products saw steep draws, which will further contribute to their relative strength. The market still expects the EIA data to be more supportive for prices than the API data; if the EIA report echoes the API report, prices call drop even lower this morning.